Totally Czeched In! 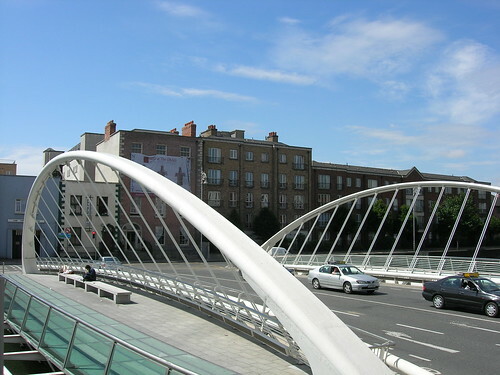 : Dublin--Gotta love the Irish! There are only two things to worry about: either you are well or you are sick. If you are well then there's nothing to worry about. If you are sick then there are only two things to worry about: Either you will get well or you will die. If you get well then there's nothing to worry about. If you die, then there are only two things to worry about: You will either go to heaven or to hell. If you go to heaven then there's nothing to worry about. If you go to hell, you will be so busy shaking hands with all your friends that there will be nothing to worry about! 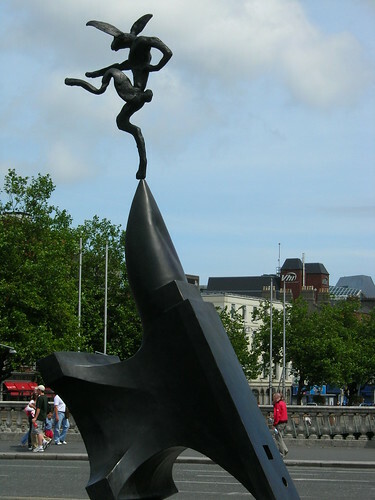 There is definitely a carefree feeling in Dublin. I don't remember the last time I was around such friendly, open people. I am positive I will return to Ireland!! I want to see a lot more of it. A pub, capitalizing on the atmosphere and reputation of the entire Temple Bar area. 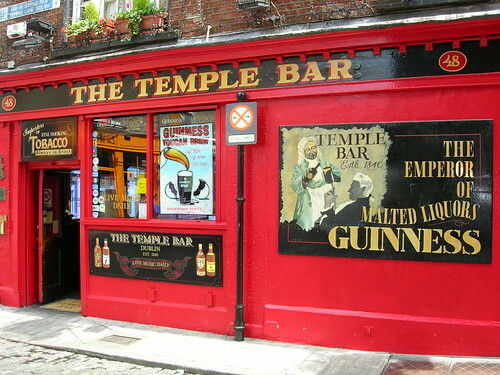 Temple Bar is a live, happening place in Dublin! Full of Pubs, people, music, life. Sean and his comical uncle (Chris? John?). Very nice people. Very fun people. 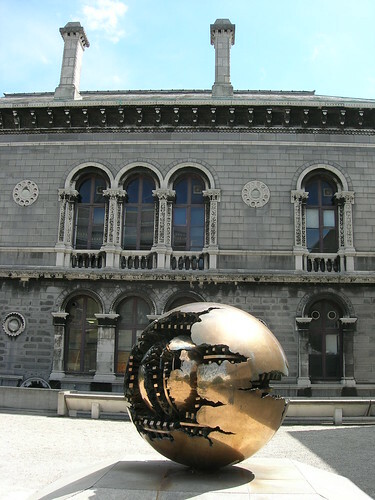 TRINITY COLLEGE--I was very curious about seeing the place where so many famous Irish Writers studied. I walked through thinking of Jonathan Swift and Oscar Wilde, in particular. And while I enjoyed a very spirited (and thankfully brief) tour, I have to admit that I was disappointed in the lack of information about the famous attendees. 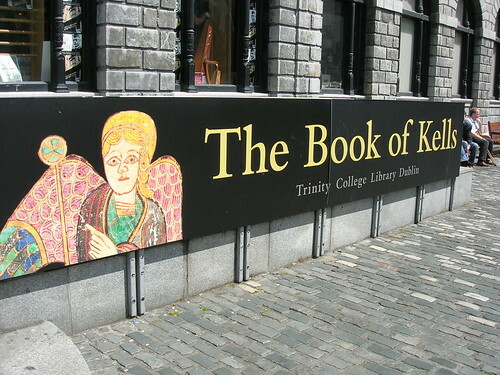 I saw the Book of Kells, but it didn't really excite me that much. Now THIS was a treat. A very interesting display and non-redundant audio tour, arranged by period and writer. 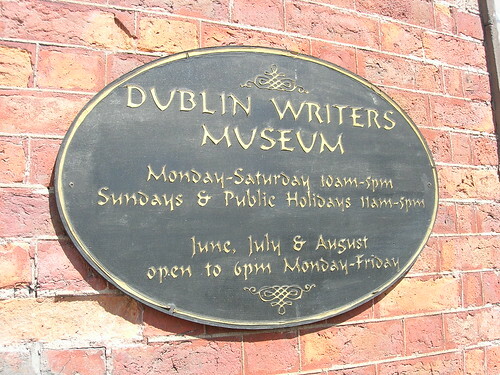 I learned a lot of fascinating things about the featured writers (Yeats, Beckett, Wilde, etc.). I am glad I made it there. Before I left, I felt obliged to buy a book by one of the Irish writers, so I looked around and came away with...Bram Stoker's DRACULA. It was a good read. I liked it a lot despite some of its irritating conventions. 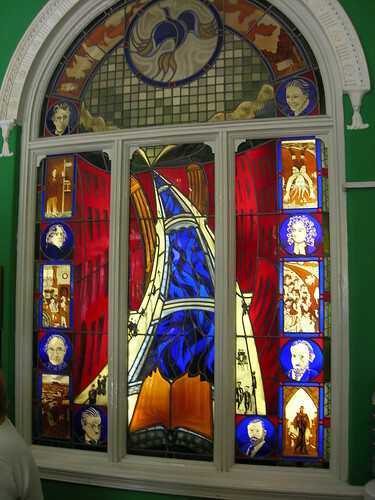 Writers' Museum window--INSIDE the building, by the way. The house used to belong to someone interesting, whom I have already forgotten about. A lot of time and events have passed since I was there--sorry. James Joyce's House. Didn't go there. Maybe next time. Would like to see what they do on Bloomsday. The tour that wasn't. 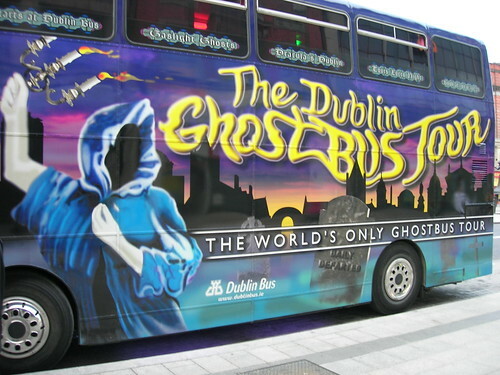 I really really wanted to take this Ghostbus tour, but I failed to plan it properly, and I missed the cut-off time for buying tickets in advance. When I got to the bus, the tour was already sold out =(. I did a ghost tour in Virgina with my mom, but it was a walking tour. I imagined that the stories in Ireland would be much more interesting--and maybe about some of the writers I like. Oh, well, another reason to go back. 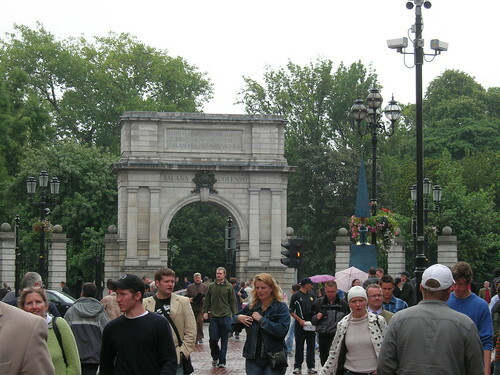 Arched entryway to St. Stephens Green. I didn't really go inside, but I walked by A LOT of times. It would be a cool place to hang and have a good talk, I think. It is very close to a great place to go shopping too, so it could be a rest stop for sure. 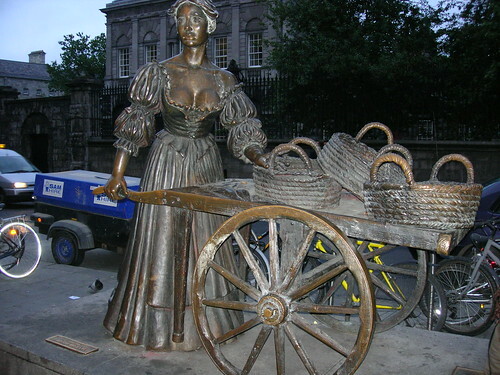 Molly Malone. I don't know if I have ever heard the song or not, but she is a famous character from a well-known Irish song. Art and life--characters are sometimes as real as actual people, and as loved. 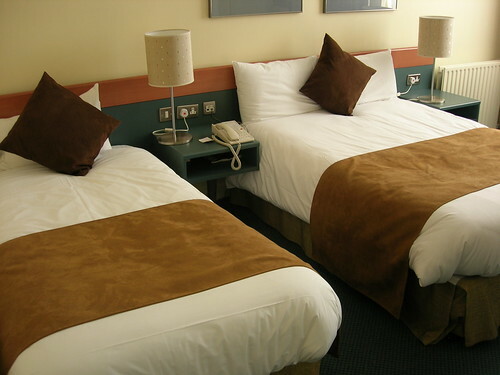 And my hotel room--my LOVEly hotel room. If it had been a bit quieter in the hallways, it would have been perfect. I was so excited sometimes just to sit in my room and watch TV--in ENGLISH!! Bless the Irish! 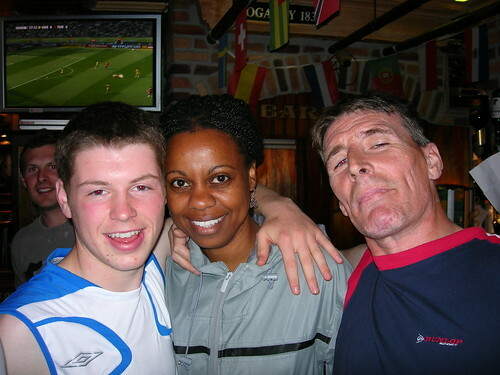 In addition to the guys I met in the pub, I also met Aoife--a super-nice Irish girl. We met up for lunch and chatted like pals. 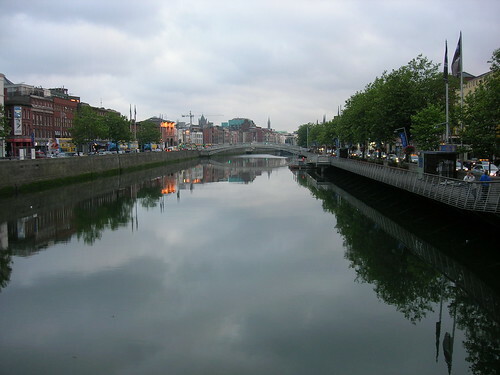 Overall, I was very impressed by the people I met in Dublin. For so many reasons, I was thankful for the Irish on that weekend!